North Sails will today officially open their new UK sail loft based in the maritime south coast hub of Gosport. The loft will incorporate many global departments under one roof: North Sails 3Di and Superyacht finishing, One Design sail production and Certified Service. It is the first loft of its kind to specialise in superyacht sails and boasts the largest raised finishing floor in the world at 1,950m². Once again pushing the boundaries of sail technology, innovation, and manufacturing, this will be North Sails' European flagship facility. The 110m long main loft floor is complemented by state-of-the-art equipment, all of which will assist production teams in producing and finishing sails faster and more efficiently than ever before. While continuing to design, manufacture and service current customers, the new space allows for work on special projects and custom finishing, especially larger projects. 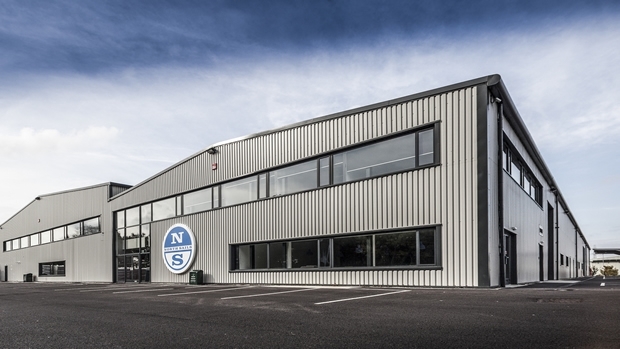 Today in Gosport, President of North Sails Group, Ken Read, will join European COO John Welch as well as Peter Dubens, Managing Partner of Oakley Capital and Chairman of North Technology Group, as they open the doors to allow invited guests to see the revolutionary sail loft and what it means for sailors around the globe. "Production has begun in all departments," said European COO John Welch. "North Sails Gosport is a response to the ever-increasing size and demand for superyacht sails, and represents a positive consolidation of our many departments. We are excited about the space we now have and the opportunity to serve our customers with greater speed and efficiency. North Sails' continued commitment to design and development is at the forefront, enabling us to keep pushing forward in all areas of sail manufacturing." Divided into two manufacturing bays, the main finishing floor has been specifically designed for superyacht finishing. The 101x30M space allows for two J-Class headsails and a mainsail to be laid out at the same time. The floor has an overhead gantry with a 3.2 ton load capacity, five rotating sewing machines and two traveling sewing machines - where the machine moves atop a belt the length of the finishing floor, stitching the luff or leech without moving the sail. In a neighboring bay, Gosport houses three plotters and two separate raised floors for One Design and Certified Service. "The Gosport manufacturing loft reflects North Sails' commitment to professional sailmaking and our ambition to remain on the cutting edge," said North Sails president Ken Read. "I'm excited for the opportunities ahead and would like to congratulate the local team for pulling it all together and creating something truly unique in the sailmaking world."